Taking a giant leap forward in time, to between 478,000 and 423,000 years ago (the Anglian), the whole area was buried in ice. Massive erosion occurred and much of the landscape was shaped; this sculpting continued during another, more recent ice age (30,000 to 12,000 years ago, the Devensian) when the Nidderdale glacier moved down the valley. As it melted and retreated up the valley it deposited glacial till, or boulder clay, and recessional moraines for example at Gouthwaite (used as the foundation for the present day reservoir dam). Following the melting of the ice the newly exposed valley sides were often too steep and unstable leading to large landslides, particularly in the Nidderdale Shales at Thrope Edge and Woodale, Limley. 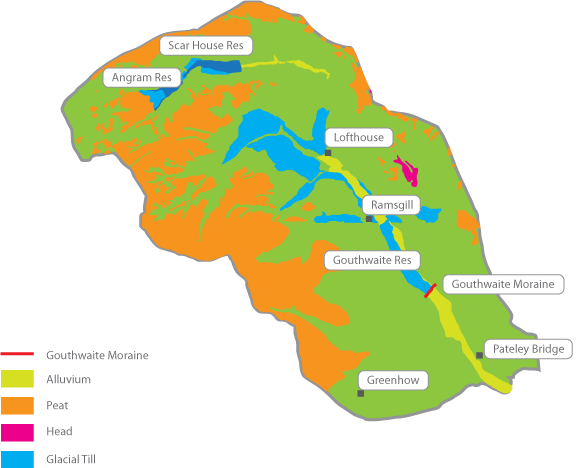 Often on shallow slopes in some areas, including Lofthouse Moor, saturated weathered rock moved downslope as head (solifluction) deposits. More recently, peat deposits have accumulated on the poorly drained sandstone upland watersheds, and alluvium has been deposited along the river flood-plains.